When miso first became mainstream as an ingredient for home cooks, or at least when I first noticed it, I knew I needed to add it to my kitchen arsenal. I hadn’t ever tried it, but from descriptions and recipes that incorporated it as an umami element, I just knew I would love it. I immediately fell in love with my tub of miso paste. It adds a delicious savory flavor to any dish that is different than salt or soy sauce (though it is a soy product). Since miso paste is fermented, it’s also a great source of probiotics! It truly lends an umami flavor to dishes that can sometimes be hard to achieve. And it’s so simple to use in sauces and marinades. One of my favorite dishes that I use my lovely miso paste for is Miso Chicken. Miso Chicken was one of the first dishes I experimented with, and it is still makes many appearances on our dinner table. It’s super simple to make, and is a healthy dinner that comes together quickly. I like to serve Miso Chicken with veggies like bok choy sautéed in garlic, or with brown rice noodles with extra sauce. I like to make an extra piece of chicken and use it in a salad for lunch. I hope you enjoy this Miso Chicken as much as my husband and I do. And if you haven’t tried miso yet, I urge you to find some! It’s a fantastic ingredient to have on hand. Preheat oven to 350° F. Lightly oil a grill pan. Heat grill or grill pan on medium heat. Season chicken with salt and pepper to taste and place in grill pan. Cook 2 minutes per side. Meanwhile, in a small bowl combine the sauce ingredients. Brush mixture over chicken and place grill pan in the oven (or close grill). Cook 10 to 15 minutes, until chicken is cooked through. It should reach an internal temperature of 165° F on a thermometer inserted into the center. While chicken finishes cooking, Heat remaining sauce in a small saucepan until slightly thickened. Remove chicken, slice and serve over brown rice noodles, zucchini noodles, brown rice, or veggies. Top with extra sauce from the pan and garnish with fresh herbs. I love miso! It adds so much flavor to foods, especially veggies and blank slate proteins like chicken, fish, and tofu. Can’t wait to try this chicken! It does! I hope you love it! 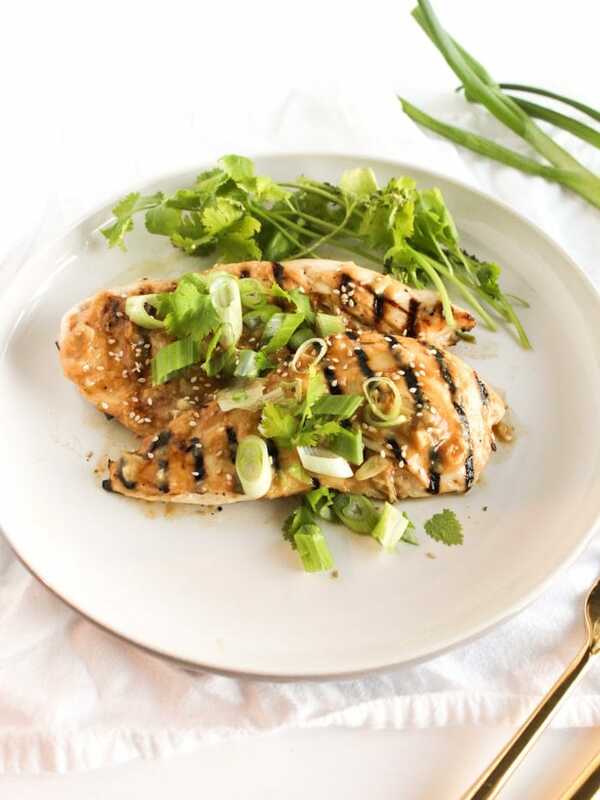 O such a beautiful flavorful chicken recipe! !